It’s not the perfect geek storm of an opening gambit that evokes not only the old-school boldly going adventures of the crew of the starship Enterprise, but also—hilariously—Raiders of the Lost Ark. It’s not how Zachary Quinto somehow manages to make Spock more plausibly divided in his half-human, half-Vulcan skin than Leonard Nimoy ever did. It’s patently not the pure nerdvana of Benedict Cumberbatch as Into Darkness’ villain, the sheer nerdly delight of which has only been enhanced by the months of teasing about just which canonical baddie he might (or might not) be playing. Cumberbatch slices out his own iconic room in geek headspace while en route to the moment when all is revealed (and beyond); his performance here will be remembered, fondly and with awe, for a long time. 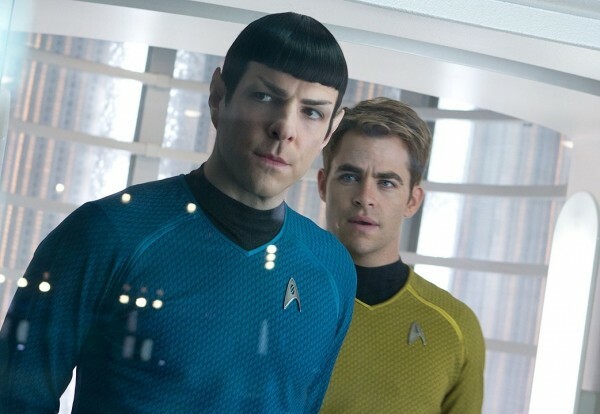 I’m also not at all sad that, once again, the team of screenwriters Roberto Orci, Alex Kurtzman and Damon Lindelof, along with director J.J. Abrams, have ingeniously crafted a Star Trek movie that works equally well for neophytes and devotees. The needs of the many on both sides of that divide are catered to with care. The in-jokes are many, but the movie doesn’t stop for them. Either you see them because you’re a honking huge Trekkie, or they’re completely invisible, and the story has lost not even the tiniest whit of impact because you haven’t seen them. No, I’m sad because—apart from one outrageously gratuitous shot of Alice Eve as Dr. Carol Marcus in her underwear, for which Abrams doesn’t bother to provide even the slightest contextual pretense—this is a Star Trek for our times. Of course, it is because Into Darkness is so rooted in the emotional, cultural and political motifs of this moment right now that it works so well for those who aren’t particularly interested in Star Trek as a thing unto itself. It’s not Into Darkness that makes me sad, then, but our times. The 1960s Star Trek series sprang from an era of social upheaval—the civil-rights movement, political assassinations, the sexual revolution, the Vietnam War—but it embodied the hope of the time as well, particularly the one represented by America’s space program. Today, we have plenty of trouble yet seemingly little hope ... and there’s little hope in Into Darkness, either. No spoilers, but the main track of the plot—the what’s-really-going-on stuff—could be said to represent what happens when hope, and a spirit of adventure and optimism, get sidetracked by selfish ambition. This is a story about terrorism as an act of egotistical will, of military opportunism, of false-flag provocations, of honest patriotism twisted for evil purposes. There’s a conscious pulling back from the old-school Trek spirit of adventure, in fact, because that Raiders-esque opening is immediately followed by the Enterprise’s recall to Earth and a dressing down of Captain Kirk (Chris Pine). Kirk’s foray onto that planet ended in a situation in which he broke the Prime Directive, Starfleet’s highest law meant to protect pre-spaceflight civilizations from all knowledge of a larger galactic culture. But the William Shatner version of Kirk was always breaking the Prime Directive, and never got called on it. What seems like a paradigm-shifting thing turns out to be a sci-fi example of what’s happening all around us today: where the higher up the food chain of power you are, and the more damage you do, the less likely you are to be held accountable for it. Kirk’s crime turns out to be breathtakingly tiny in the grand scheme of what happens here. I enjoyed Into Darkness immensely, and I can’t wait to see it again, but I’m not sure I could call this a summery popcorn-y sort of film—it’s too grim for that. There are too many echoes of 9/11 for it to be truly escapist “fun.” And if there’s hope to be found here, it’s in only moral and ethical stands taken, which leave some characters in unpleasant places they’d rather not be.